Having heard on the grapevine that one of East Hampshire’s loveliest Georgian houses, Grade II*-listed Ropley House, near Alresford, was about to come onto the market, last week, I tracked down its owner, the effervescent Anna-Rose Knatchbull-Hugessen, née Bramwell, a childhood friend from Ireland that I hadn’t seen in years. Her late husband, Peter, bought Ropley House in 1977, and it was their much-loved family home from their marriage in 1992 until Peter’s death in February 2008. ‘I had hoped to keep the house going, but it really is too big for me now,’ Mrs Knatchbull-Hugessen says with some regret, as she prepares for a late-February launch in Country Life, when this ‘perfect Jane Austen house’ will be offered by Savills (020-7499 8644) at a probable guide price of £4.25 million to £4.5m. This part of Hampshire is Jane Austen country, for the nearby village of Chawton, a few miles further up the A31, was where Jane spent the last eight of her 41 years, before dying in Winchester in 1817. But Ropley’s Austen connection goes further than that, as Mr Knatchbull-Hugessen was the great-grandson of Fanny Catherine Knight, one of Jane Austen’s favourite nieces. Fanny, who regularly sought her aunt’s advice regarding her various unsettled courtships, was the eldest daughter of Jane’s brother Edward, who was adopted by rich childless cousins Thomas and Catherine Knight, and changed his name to Knight on inheriting their estates. It was Edward who provided a house on his Chawton estate for Jane, his mother and their sister Cassandra, Jane’s closest confidante. 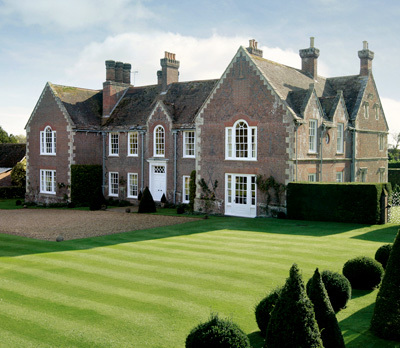 Genteel Jane Austen may not have been on visiting terms with the Duthys of Ropley House for reasons mentioned below, but she would certainly have admired the house from afar on her frequent journeys along the A31 between Chawton and Winchester. Ropley House stands back from the road on high ground owned in medieval times by the See of Winchester; large parts of the manor of Ropley were still owned by Winchester College until quite recently. The present Ropley House was built for John Duthy in about 1750 on the site of an important Tudor house dating from 1530 or there-abouts. In the early 19th century, the Duthy family was ‘divided and factionalised’ by smuggling, which, according to local records, was carried on ‘with a high hand in Ropley for many years’. Kegs of whisky were brought up in carts and wagons from Portsmouth and stashed in various cottages around the village or even the parsonage tithe barn often with covert assistance from ‘the young Mr Duthy’, who would take his father’s horses from the stables by night to help with the distribution. The classic Georgian manor house, built of mellow red brick under a tiled roof, was extended in the late 1920s with the addition of a service wing to the north. With 7,535sq ft of living space on three floors and 28 acres of formal gardens, railed paddocks and parkland, Ropley House is a substantial country house by any standards. It boasts typically elegant, well-proportioned reception rooms with high ceilings, fine fireplaces and cornicing, and original sash windows, which overlook the gardens and grounds. The accommodation includes a reception hall, a library, a drawing room, a dining room, a study, a kitchen/breakfast room, master and guest suites, plus six further bedrooms, three further bathrooms and a games room. Additional buildings include a cottage, a four-bedroom bungalow, garaging, stabling and various farm buildings. The house was in pretty good shape when Mr Knatchbull-Hugessen bought it, and, apart from some ‘fine-tuning’ over the years, the interior, as befits its Grade II* listing, has been little altered. The enchanting gardens, however, have been Mrs Knatchbull-Hugessen’s creation. Set against a backdrop of some splendid beech, walnut and horse-chestnut trees, and a couple of eye-catching maples, they include large areas of pristine lawn surrounded by hedges and shrub borders, and a romantic Japanese garden with a lake, an island and a flint folly. Most romantic of all, perhaps, is Mrs Knatchbull-Hugessen’s new ‘secret garden’, a quiet corner with a lawn cut in the shape of a shamrock a reminder of her Irish roots in the heart of Jane Austen’s Hampshire. As the former CEO of Mallett plc and a world expert on English furniture and the decorative arts, the late Peter Maitland, who died in October last year, had a legendary eye for detail. It shines through every corner of his beloved Abbey House at Witchampton, near Wimborne, Dorset, which came to the market last week, at a guide price of £4m through Chesterton Humberts (020-7594 4746) and Savills (020-7499 8644). His longstanding connections with the owners of England’s grand country houses also worked to his advantage when he came to choosing a house on his retirement from Mallett in 1999. At that time, Abbey House was about to be launched on the market for the third time since 1987, when it was first sold off from the surrounding Crichel estate, which still owns much of Witchampton village, and most of the land round about. Estate owner Mrs Marten suggested that selling agents Savills, who manage the Crichel estate, should contact Mr Maitland, which they duly did; he was the first to see the house, and bought it on the spot. 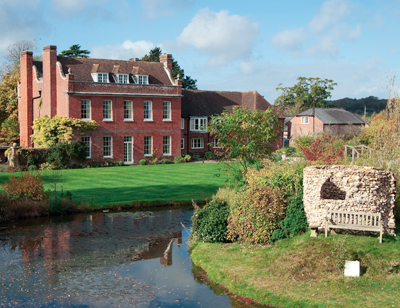 Over the next 10 years, Mr Maitland made it his life’s work to restore the imposing, Grade II*-listed village house (one of the first in Dorset to be built of brick) and its 6.8 acres of magnificent, partly walled gardens and grounds on the banks of the River Allen. Formerly known as Witchampton Manor House, Abbey House was originally built as a priest’s house in the early 1500s probably by the Fitzalans, Earls of Arundel, who were lords of the manor at that time and enlarged in 1874 and again in 1915. From the 18th century, it was owned by the Crichel estate and continued as the rectory until the 1820s. After 500 years as the focal point of life in picturesque Witchampton village, Abbey House faces the future as Mr Maitland would have wished immaculate and beautifully manicured, with not a hair out of place. The 10,155sq ft house has five reception rooms, a kitchen/breakfast room, eight bedrooms, five bathrooms, a studio with a home cinema and a staff flat. The 1,735sq ft coach house is currently used as garaging and stabling, but could be converted to separate accommodation, subject to the usual planning consents.